Tonight I am going to start of with something I don't really love and I can almost hear the moan from all my female friends out there at the sight of this photo. 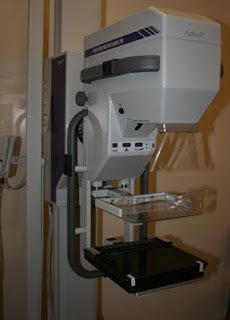 Yes it was my time to have a mammogram!!! I have had them for many many years as I have a family history of breast cancer. My Mum was a breast cancer survivor of 28 years. She was diagnosed with breast cancer when she was 68 and luckily for all of us stayed around until she was 91. Shane actually asked me this time what it was like having this xray. It is really hard to explain to anyone who hasn't been through this wonderful experience, all I can say is just think of pancakes. Now after that I really have to finish off with something I love. Those close to me often pick on me for doing classes in anything and everything. I just love learning something new, even if I don't use that skill for years afterwards, I just love the feeling it gives me to learn new stuff. Tomorrow night I am doing a class in Resin Jewellery and I am looking forward to sharing my creation with you all.